Though the days are slowly starting to get longer as we enter the new year ... we're definitely not out of the winter woods yet, and Montana's small towns have a few more months of looking like this. A little depressing, perhaps, but still better than anyplace else. It looks bleak, doesn't it? 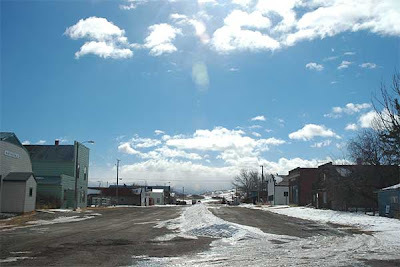 But there's a lot of color, inside those little buildings; the characters that live in small towns make it interesting. In Jordan, we have Basco, our Basque friend who lives in the old firehall on Main Street and plays cribbage with anyone who slows down to say hello, no matter the weather. He eats garlic by the crate and red wine by the barrel. Oh, not bleak at all! As you said, places like this are just overflowing with wonderful character. If you want bleak, go to a big city and look at the sprawl.